This is a simple but divine chocolate cake, with a surprising cognac twist. The key to its success is the quality of ingredients. Great Aunt Rachel insisted: only top quality chocolate and top quality cognac. I have tried it just as she asked as well as with a few compromises, and she was right- there is a big difference, so don’t cut corners when you fill your shopping basket. Add to bowl A (butter+sugar) the whipped whites. Add slowly but keep whipping with blender. Add slowly melted chocolate (use lowest mixer speed). Divide mixture into two even parts. Half store in fridge. Into the other half (still in blender bowl) blend the two tbs spoons of matza meal, and bake in oiled pan (and then sprinkle a thin layer of matza meal/flour) for 15 mins at 180C (360F). After baked cake cools completely, move gently into serving tray and top with the cream part that remained in the fridge. 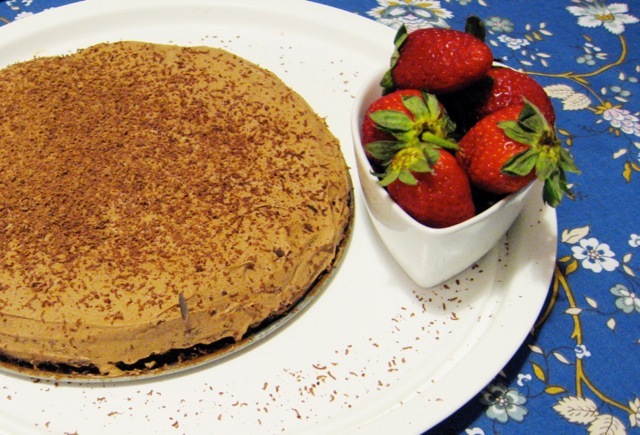 Decorate with ground chocolate flakes and serve with fresh whole strawberries. This is a small cake. I have also baked it as muffins, and they become small and personal-great! Note: since this cake contains no milk or cream, although rich it is not heavy on the stomach and thus, don’t be surprised if you finish it much faster than you thought!